The International Monetary Fund has attacked the bailout deal offered by eurozone leaders to Greece. The creditor said Greece’s public debt had become “highly unsustainable” and it needed relief from its debts. The BBC’s economics editor Robert Peston said the criticism was savage. The IMF suggested options including writing down the debt – a move most fiercely resisted by creditors. The Greek parliament must pass four pieces of legislation on Wednesday. It is the first requirement of the deal offered after hours of negotiation in Brussels on Monday. The measures – which face resistance from Prime Minister Alexis Tsipras’ own MPs – include taxation increases and pension curbs. 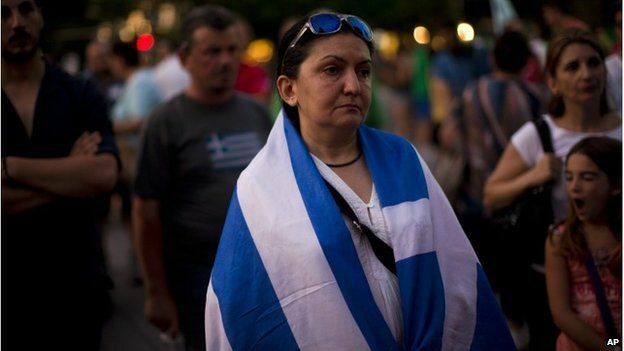 Greece owes about 10% of its debt – €1.6bn (£1.1bn) – to the IMF. The BBC’s economics editor says the IMF’s assessment makes it much harder for Mr Tsipras to persuade the Athens parliament to back the measures needed in Wednesday’s votes. It brings into question the validity of the reform measures demanded by the eurozone and endorses the kind of debt write-offs the Greek public have been arguing for, he adds. Why on earth should Greek MPs vote for a painful economic reform package which the IMF – the supposed global arbiter of these things – does not believe will put the country back on the path to prosperity? The eurozone creditors, and Germany in particular, forced Alexis Tsipras – against his strong preference – to accept IMF participation in the next formal bailout package to be negotiated if Greek MPs pass the initial reform measures tonight. They told him, in effect, he would be turfed out of the eurozone and into national ruin unless he took more of the IMF’s money and fiscal bossiness. Which also look tragically comic tonight – with the IMF saying that if it’s all the same to Mrs Merkel, it would rather not touch Greece with a barge pole. Or to be tediously literal, the IMF has made it clear that it does not wish to participate in any further Greek bailout, unless Germany and the rest drop their vehement opposition to big write-offs of Greek debt. Which should be music to the ears of Mr Tsipras, except that presumably he would quite like his creditors to agree among themselves, before presuming to tell him how to run his own shop. The IMF said it regarded forecast rates of growth for Greece as unrealistically high. 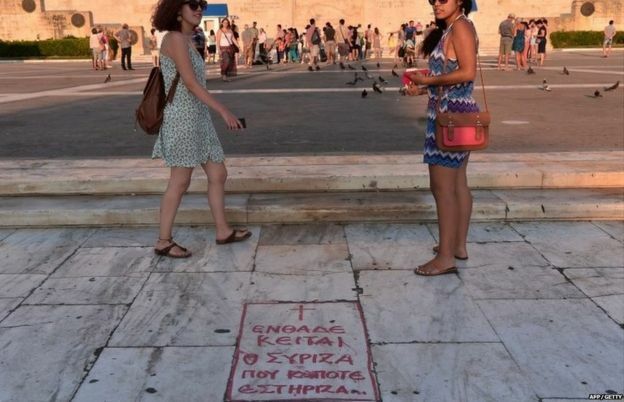 Its analysis released on Tuesday night pointed to Greek government debt reaching a peak of close to 200% of GDP or national income over the next two years, which it called “highly unsustainable”. On Tuesday, Mr Tsipras said in an interview on state television that he did not believe in the bailout offered but was willing to implement it to “avoid disaster for the country” and the collapse of the banks. The conditional agreement to receive up to €86bn (£61bn; $95bn) from the EU over three years depends on further economic reforms – including the labour markets, banks and privatisation – being passed after Wednesday. Greece also faces an immediate cash crisis. Banks have been shut since 29 June. Mr Tsipras warned banks are unlikely to reopen until the bailout deal is ratified, and this could take another month. A suggestion of providing Greece with emergency funding under the EU-wide European Financial Stability Mechanism has been opposed by Britain, which is not part of the euro but is an European Union member.